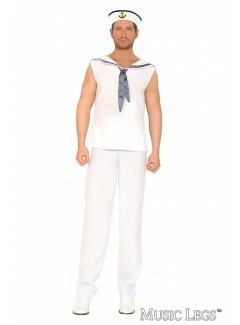 Two-Piece sailor costume. Sailor shirt with official looking combat ribbon and patches. 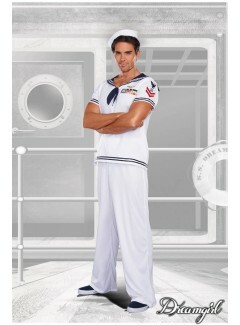 Includes sailor hat. Two-Piece Set. Adorable retro-styled dress with sailor collar, sequin anchors and a full circle skirt. Sailor hat included. (Earrings not included). Three-Piece pilot costume. Short-sleeved khaki dress with military-style buttons at the front and flight patches; Self-tie belt; Matching shorts. Two-piece defender costume. Body slimming, sleek long-sleeved wet look jumpsuit; Padded chest and shoulder armor. Gloves and weapon not included. 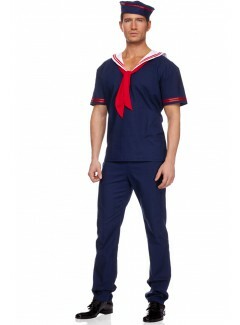 Five-piece sailor costume. Sailor dress with ruffled skirt, attached garters, belt, sailor hat and wrist cuffs. 6 Pc. 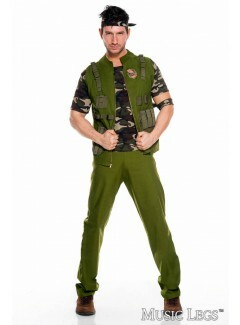 Includes: Camouflage zip up top, camo pants, hat, adjustable suspenders, belt and gloves. 6 Pc. 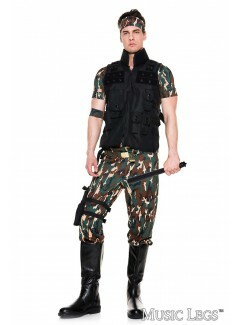 Includes: Army green zip up romper, bullet belt, hat, belt, gloves and leg holster. 3 Pc. Includes: Zip up romper with gold buttons and red detailling, matching hat and white gloves.